A South Yorkshire Police detective has been accused of repeatedly hitting a suspected burglar with a shoe while the man was handcuffed and being restrained. DC Christopher Hanson denies claims made against him by Lee Stott, who said he was attacked in his bedroom as officers tried to find out the location of a stolen car. Details about the alleged incident at Stott’s flat on Brightmore Drive in Netherthorpe, Sheffield, were revealed at the start of a six-day misconduct hearing involving DC Hanson and two other police officers. DC Hanson along with PCs Christopher Cheung and Trevor Roberts are alleged to have lied in their statements about what happened at Stott’s flat. Barrister Stephen Morley, representing South Yorkshire Police’s professional standards department, said analysis has indicated injuries to Stott were ‘in keeping’ with being hit by a shoe. Mr Morley told the three-person panel hearing the misconduct proceedings they would have to treat the evidence of Stott, who later admitted the burglary and is currently in jail, with ‘some caution given his past offending history’. But he said there appeared to be other evidence that supported Stott’s account. 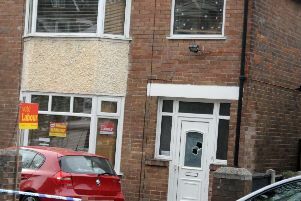 The hearing in Chapeltown was shown CCTV footage of officers kicking their way into Stott’s flat after they said in their original statements that the door had been opened for them by Stott’s girlfriend. He said that if all three officers had deliberately lied in their statements ‘that is a very serious breach of the standards’. Mr Morley said DC Hanson and PC Cheung said Stott had told them his injuries had come from falling over in a park. The arrest happened at around 9am on August 30, 2014 - just hours after Stott had stolen an iPhone, iPads and a Honda Accord car from a house in Sheffield. The iPhone was traced to Stott’s address, leading to officers going to his flat. But Stott said the officers had got ‘a bit mad’ as they attempted to find out where the stolen car was. Giving evidence while handcuffed to a police officer, Stott said DC Hanson started hitting him with his trainer that had been on the floor in his bedroom. Stott said he had only been wearing his boxer shorts while being hit and had shouted ‘Stop hitting me’ at DC Hanson. He said he then signed a statement apparently confessing to the burglary that was written by DC Hanson and he had not read through. Rick Holland, representing DC Hanson, said Stott was a drug user with numerous past convictions for burglary and theft who is pursuing a civil claim for compensation against South Yorkshire Police. Stott said he was ‘not really bothered’ about receiving compensation. Stott agreed during cross-examination he had made previous complaints about police officers after being arrested for other offences. These included after his nose was broken by a truncheon while he was running from the scene of a crime and a complaint against a dog handler after a police dog attacked him following a chase after a burglary. Stott subsequently dropped both complaints. Stott also accepted some of the marks on him that were allegedly caused by being hit with the shoe could have been caused by something else. Mr Holland said when Stott had made up the allegations as he thought ‘you might be able to get yourself out of this if you made a complaint against the officers’. Stott said that was not the case. Stott accepted he had lied in his original police interview about his involvement in the burglary. When evidence finished for the day, Stott said he did not wish to return for further cross-examination.